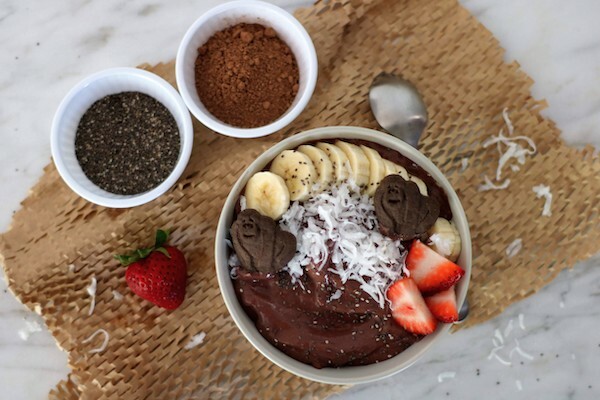 This Chocolate Acai Smoothie Bowl is chocolatey healthy deliciousness. As a mom, I find it very important to keep the health benefits a priority for the kids. 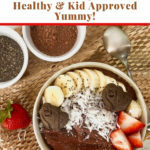 We packed this smoothie bowl with nutritious ingredients making it ideal for breakfast, lunch, or an after-school snack. I had been thinking about this smoothie for a long time. 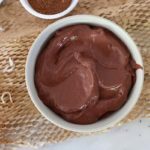 The idea was to create a super healthy chocolate smoothie bowl with lots of nutritious ingredients. What kid doesn’t love chocolate…or adult? Since we’re smoothie lovers over here, the Blueberry Cashew Breakfast Bowl, and the Banana Split Smoothie have already set the bar, so we knew it had to be amazing. I believe, and by the kids reaction, we did it! 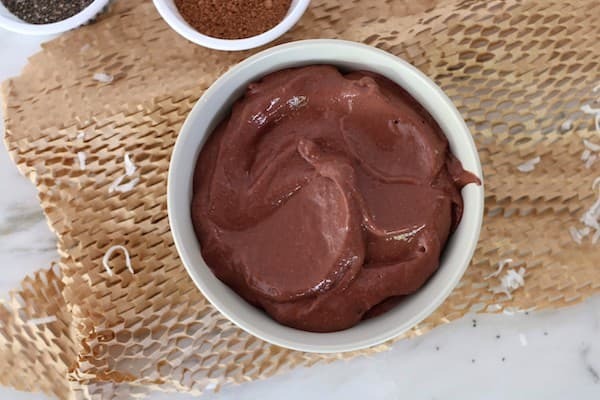 Acai is a large grape like berry that grows on Acai palm trees in Central & South America, native to the Amazon region. They’re referred to as a grape, but are actually part of the drupe family. A drupe is a fruit with a single inner pit inside. The berry is 1-inch (2.5cm) round, and has dark purple skin with the inner flesh surrounding the large seed. 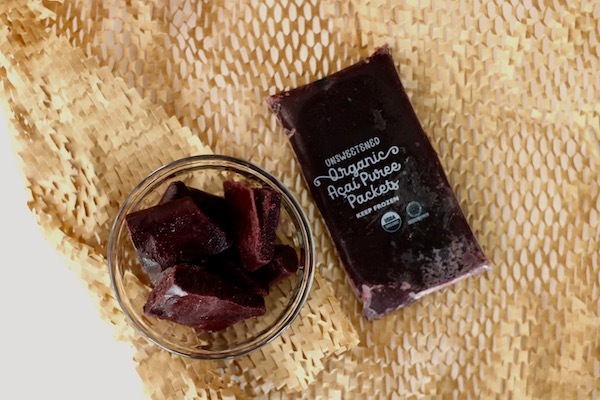 These berries are described as tasting like a cross between raspberries, blackberries, and unsweetened chocolate. Unfortunately, Acai is not sold outside of where it’s grown due to their short shelf life. 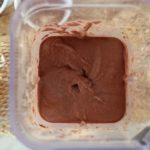 In the US we’re more familiar with Acai in the form of frozen puree (I use the puree in smoothies, and smoothie bowls. ), dried powder, and juice. Yes, they can be very healthy depending on what you put in them. The Acai berry is actually very low in calories, and sugar. Always check the Acai labels for sugar grams , and other added ingredients when purchasing. Also, what are you adding to the smoothie bowls? Make sure to check those labels as well. For example, check the yogurt, milk or milk alternative, other fruit, honey or agave. All of these ingredients can up to calories and high doses of sugar. Aim for plain Greek yogurt, berries, and products that have fiber, low sugar or no added sugar. IS AN AVOCADO A FRUIT OR A VEGATABLE? Is an avocado a fruit or a vegetable? I love this question, and I love the answer. An avocado is a fruit. Who knew? Now it makes perfect sense why it tastes so delicious in smoothies and smoothie bowls. 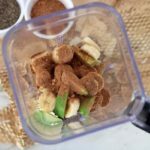 Since avocado has such a mild flavor, it won’t change the flavor of your blended masterpiece. 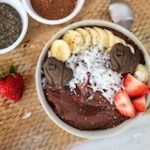 Not only does it make your smoothies and smoothie bowls extra creamy, but it has a list of health benefits. Best of all is they’re great for the kiddos. 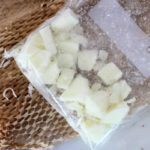 Freeze sliced banana in a freezer bag. 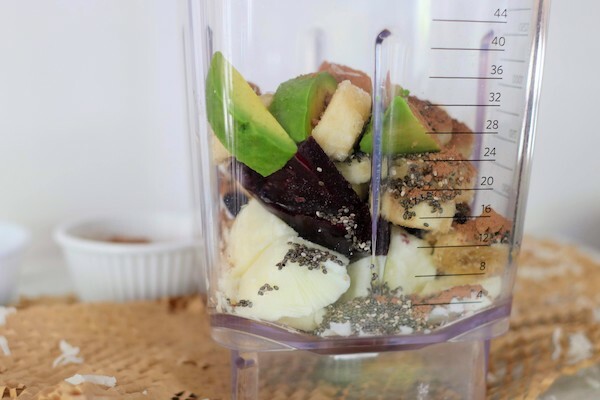 This makes it easier for your blender when blending all the ingredients. 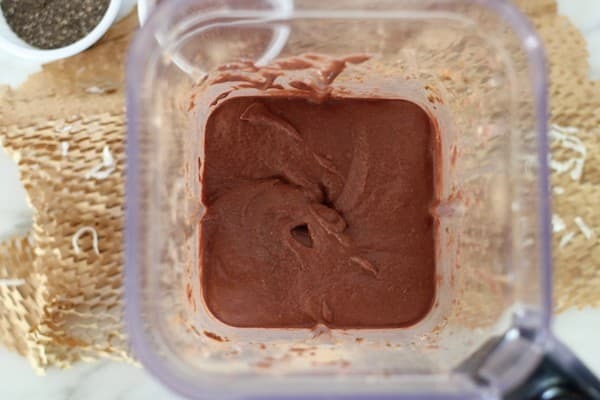 Frozen bananas with also give your smoothie bowl a creamier texture. 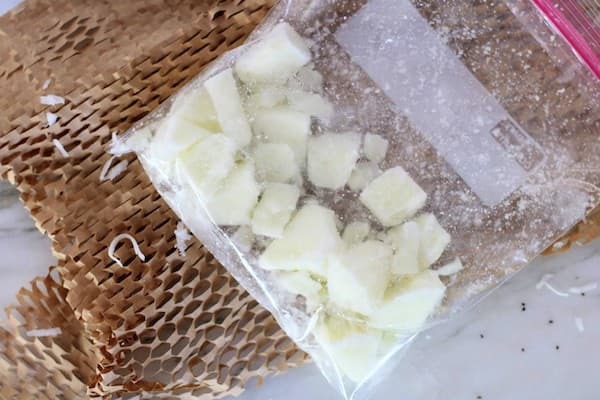 Freeze the yogurt in ice cube trays. The more frozen ingredients, the thicker your smoothie bowl will be. Add the liquid a little at a time. If you add too much liquid, you will end up with a smoothie and not a smoothie bowl. 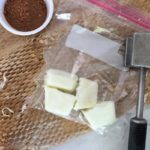 Add the cacao 1 tablespoon at a time. This can get very chocolatey, so text it with each addition for your desired taste. 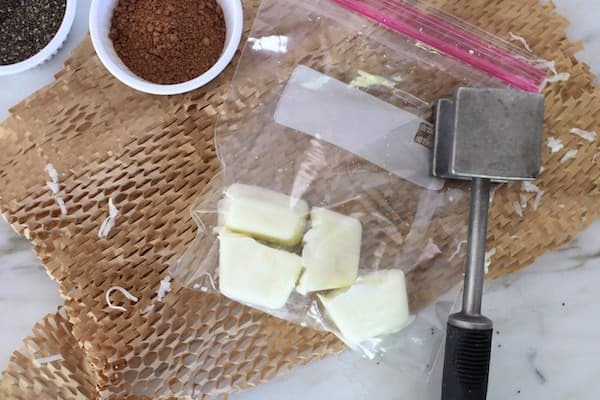 Same for the sweetener as in the addition of the cocao powder. Add it, and test it for your desired taste. Don’t forget that this will be naturally sweeteners with the fruit. The cute chocolate ape cookies are a special touch for the kids. It did have the wow effect on them. Super cute! Please let us know what you think, and leave us a comment below. 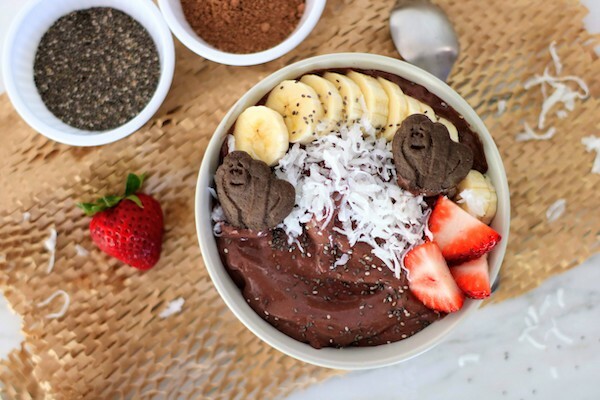 This Chocolate Acai Smoothie Bowl is chocolatey healthy deliciousness. I wowed myself with this recipe. 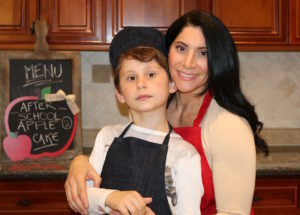 When creating a recipe I always think about the health benefits for the kids. This smoothie bowl is power packed with nutritious ingredients making this ideal for breakfast, lunch, or an after-school snack. 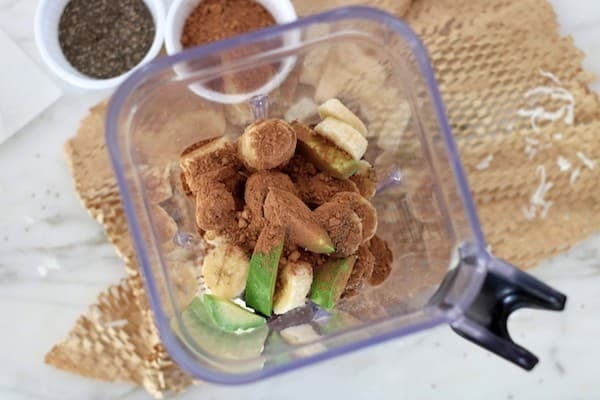 Measure out all your ingredients, and add to the blender in order from list. I prefer the frozen items on the top, as it's easier on your blender. Pour into bowl, and add your favorite toppings.